So Great!!! I love this and it looks exactly like the PB Wreath!! And the burlap hanger puts it over the top! Very pretty and I love the price tag! Oh AnNicole I love it! LOVE LOVE LOVE IT!!! Now I'm totally going to copy YOU! Very cute! You done good!! AWESOME job!!!! And the Burlap ribbon really completes the look! Great job!!! looks beautiful and the price makes it awesome!! Looks fabulous! Your post is soooo funny because I'm making the exact same thing. I loved the PB wreath too, but not the price. I'm using florist wire to attach my ornaments, so I don't have to take them off when X-mas is over. Great minds think a like!!! Rachel - Wow...talk about great minds :)! What an adorable front door! Wow! It turned out great! I'm not super happy with my Christmas wreath, so I may have to spruce it up this year. Love yours! Ooh, I like yours better than the PB one! Love it! I've been repurposing everything around my house so that I can decorate in new ways, despite this recession! Love it and can't wait to try it myself! Beautiful, I love it! I love PB, but really $79 for a wreath? Yours looks just as pretty. I love it! I think it looks better than the PB one! Very pretty! Always love a PB knockoff! That looks LOVELY! Gotta love PB knock offs! Very cute and so easy! Great job! That is so amazing-I am going to see if I can make one too! Thanks for sharing this great idea. Gorgeous job! Would give it a try, except mine from a few years ago is still looking good! I LOVE your blog! Your ideas always inspire me and I especially admire that you create them with a budget in mind. I can't wait to try it myself. You're amazing!! Anyone who can copy something from Pottery Barn for virtually FREE gets LOTS of stars in my book!! And, as for Pottery Barn, just remember: Imitation is the sincerest form of flattery. very pretty! Got to love doing things for less. I am all about that. Fabulous!!! Eat your heart out Pottery Barn!!! It's not often that I comment on wreaths, but this one is gorgeous, and so simple! Thanks for sharing your pretty. Just popped over from Cindy's place and wow am I glad that I did. Thanks for sharing this tutorial, it's so simple but so stunning that I know I could try this myself. I really need one of these. Thanks! I love these kind of wreaths with the ornaments, thanks for the step by step instructions! I love it! So easy and looks JUST like the PB one! It looks just like it!! Good job. I have to get back now, to look at the photos of your gorgeous house! Looks great & the ribbon you used adds the perfect touch! Turned out beautiful! Love to save money- I'll give this a try! Thanks!! Love the copy!! I also love the way you hung it so low on the door! Great look! I'm going to remember that when I hang my wreath this year! Thanks for sharing! LOVE it! My Christmas wreath needs a makeover, BADLY!! I'm going to try this I think! Just found you and I am so looking forward to getting to know you!! i have a green wreath that I haven't known what to do with for 2 years! Now I know!! Thanks so much! Now how do I make and ugly maroon door cute? I rent - so I can't paint it, or I would. I've been thinking of just covering it in paper for the holidays, so my wreath will look cute! This Wreath is more me...I have seen lots of tutorials on just the bulb wreath which is fab. but this is even more fab. I love this one. I may have to create it. Its amazing how there are people out there that 79 dollars on a wreath is nothing to them. In this economy, what you have done is so great, and cost friendly.. WAY TO GO! Very nice! 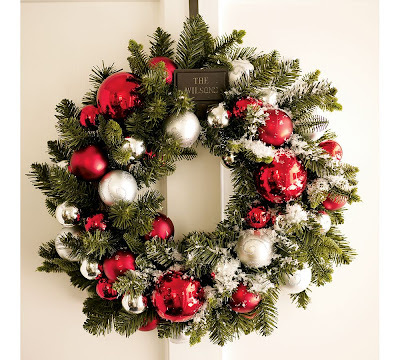 Pottery Barn should be flattered that you considered their wreath to be worthy of duplication. GREAT job...I will NEVER buy from them again! LOL (yeah, right!). Thanks for the inspiration. Looks LOVELY! I love a good PB fake out! Beautiful! You did a great job, it looks better than PB. I love the webbing ribbon too. Fantastic! I fell in love with PB's wreath too, Love your version even more. I agree... very classy and even better than PB. I love it! Very classy and pretty. Oh I LOVE this idea!! May have to give it a try myself!! Thanks! I bought this wreath four years ago! Now I am super sad! Wow, this looks just like the real deal! Great inspiration, I just purchased the stuff I needed to make my holiday wreath! Love it! I saw this wreath and hate the price tag as well! Looks awesome! Love the upholstery webbing ribbon--I had the same idea and used it all over this year. Even on my tree! :-) Love that rustic touch. Hi Annicole! I am loving all these home decor...home improvement blogs that I have found...yours being one of my top 5! I will definitely have to make one of these gorgeous wreathes. Right now I have geranium red paint on my front door...what color is used on your front door? It's black...but not too black...if that makes sense. Keep doing what you're doing...I always look forward to your next post! Hello Anonymous - thanks so much for your nice comment. I actually asked for "true black" at Home Depot. I had it mixed in a satin finish though, and I think that might make a difference in how it looks. Thanks for the idea! Hadn't seen the PB wreath, so officially - I copied you. My daughter and I made our wreath this weekend and it looks fantastic.